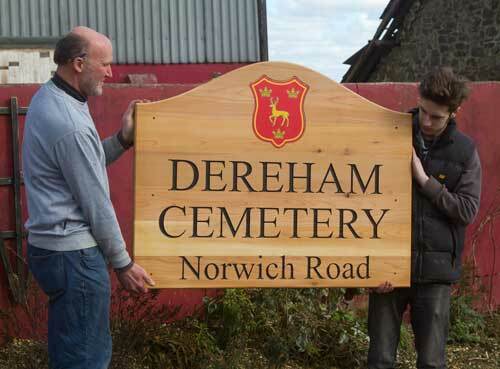 We make a huge range of wooden signs in a large range of timbers. 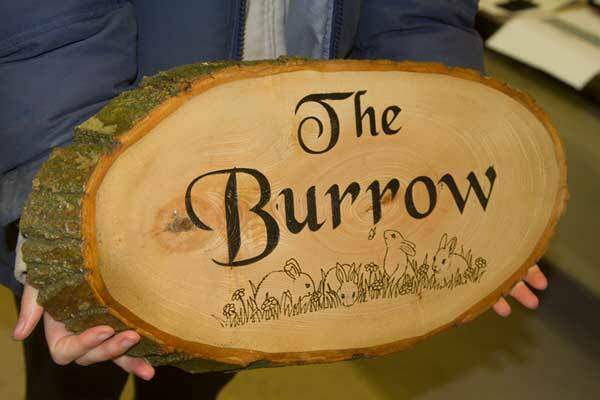 On this page we are showing a whole variety of wooden signage which we have made to our customers specifications. 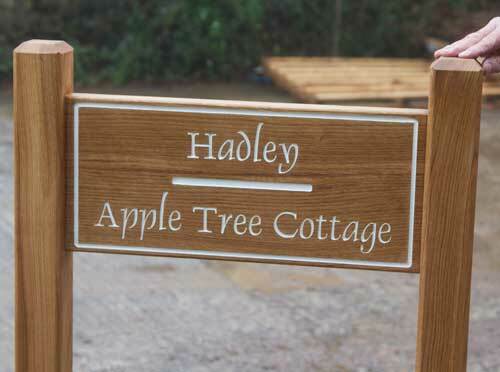 Each wooden sign is unique - you choose the size, the timber, the font and an image if required. Click on the images below for more information. If you need help - give us a call. A lovely rustic timber slice with the bark still attached. Each one is unique. 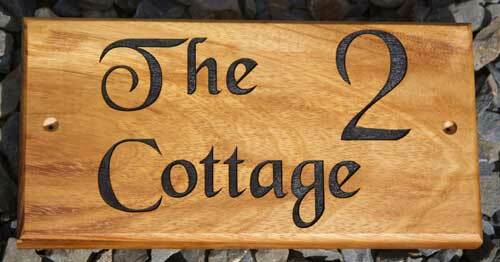 This wooden sign was made of oak and the size is 300nn x 225mm. The whole artwork was sent to us by the customer as an AI file. If you are unable to send a vector file our designers can help with creating your design. The background of this sign was lasered away leaving the letters raised. Painted wooden signs have become very popular. This one measued 451mm x 100m. The colour is Farrow and Ball Purbeck Stone. 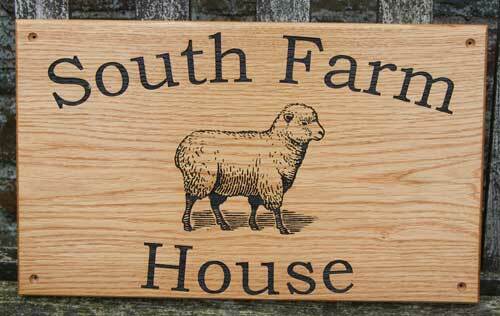 A beautiful oak sign made using the customers artwork. It has been finished with a hard wearing satin varnish. Iroko is a wonderful timber for outdoor signs as it is full of oil and therefore requires less maintenace. The sign above was shaped as an arrow one side and a mortice joint for a post on the other. 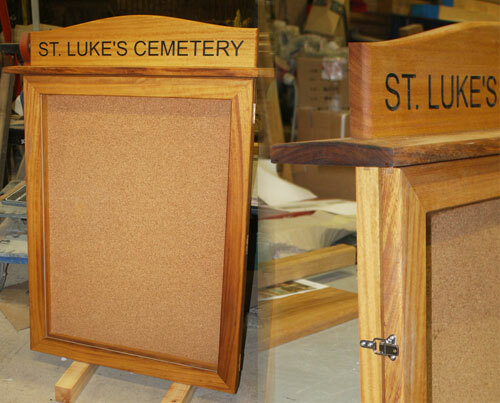 This beautifull wooden notice board was made using Iroko wood for low maintenance. The catches and hinges are all stainless steel. Also includes a weatherprrof seal. 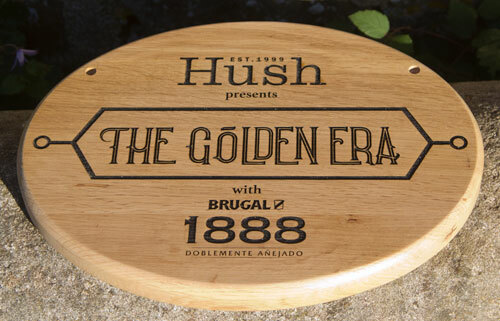 This plaque was simply laser engraved into the wood without any paint-fill. The wooden sign above was made in Iroko but more often make them in oak. 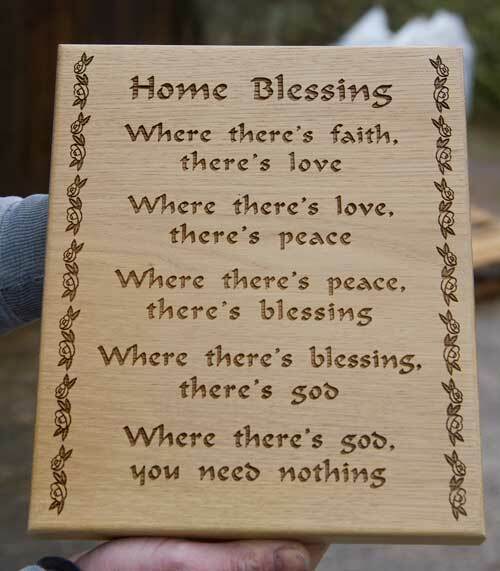 They can be made in natural wood with carved letters or painted wood with painted letters. This octagonal finger post was 3m tall and each arrow was 150mm tall. 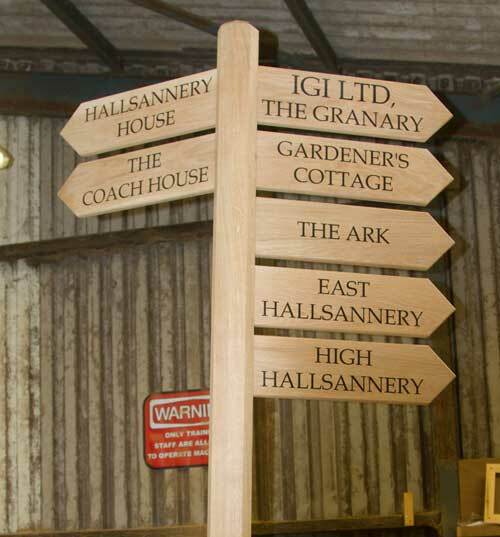 We can make finger posts to any size and with any number of arms. The photo above shows the finger post just before going into the sprayroom to be coated in several coats of a tough satin varnish. For wooden gravestones we normally use Balau. This is a very heavy timber full of its own oil and it lasts a long time. Normally the letters are left unpainted but in this case they were painted Farrow &Ball lichen It must be noted that balau will form small cracks. The size was 450 x 400 x 90mm. 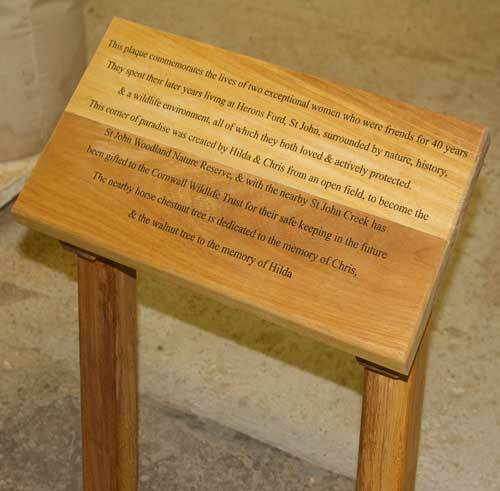 A memorial sign made in Iroko wood which can be left untreated. The size was 380mm x 265mm. Standard butterfly images. 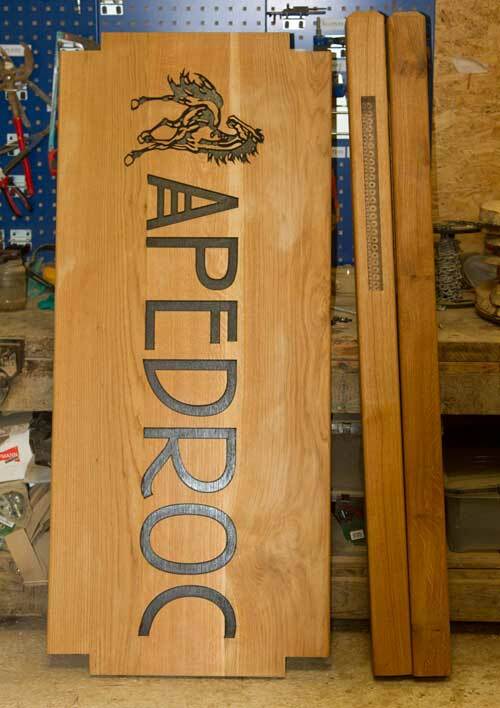 These beauiful Exmoor posts can be used for hanging a whole variety of signs. The photo showing above was made in Oak. 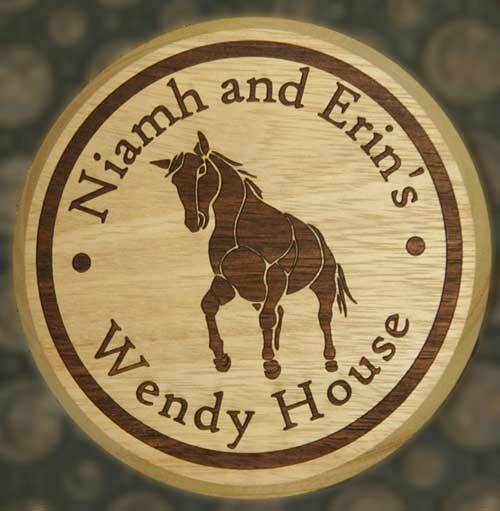 This round wooden sign was made for a wendy house. It is small at only 150mm across. The lettering has been burnt in with a laser and left unpainted. 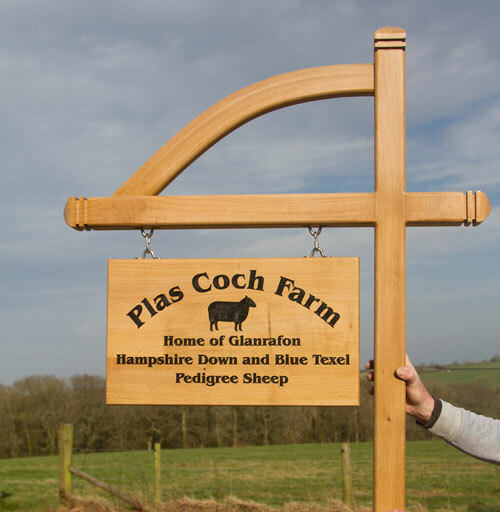 This large oak sign has been made with morticed joints to slot into two 5ft 4"x4" posts. 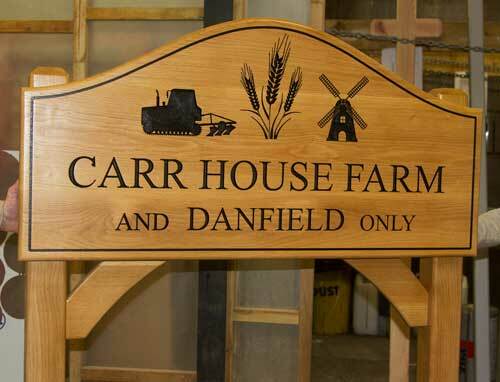 Large signs are carved on the CNC router and cannot have quite as much fine detail as lasered wooden signs. 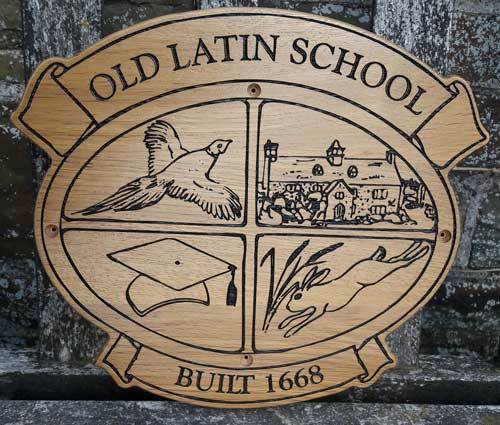 This oak sign was only 300mm x 225mm. The wording and detailed images were all burnt into the sign using a laser. The sign was then finished with a hard wearing industrial satin varnish. 2.4m hanging post with arm and 500x400mm sign board made from Tricoya a wood based board. Colour Farrow and Ball Stone Blue with cream letters. 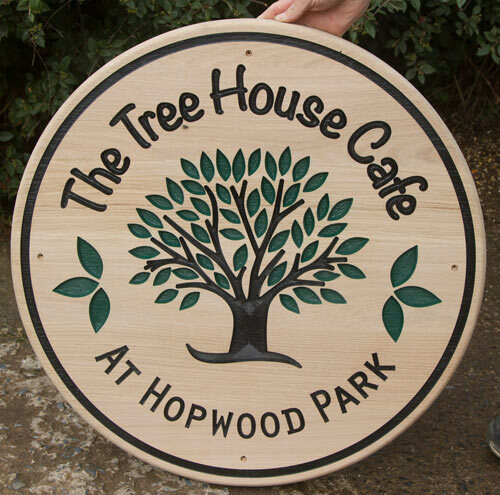 This wooden sign was made from oak and shaped to match our customers artwork. The sign measured 348mm x 300mm. A laser was used to burn in the detailed images. The shaping charge depends on size and complexity so just email us for a quote. Red cedar is one of the few timbers which can be left untreated. It weathers over time to a silver grey colour. The size on this sign was 150mm x 300mm. 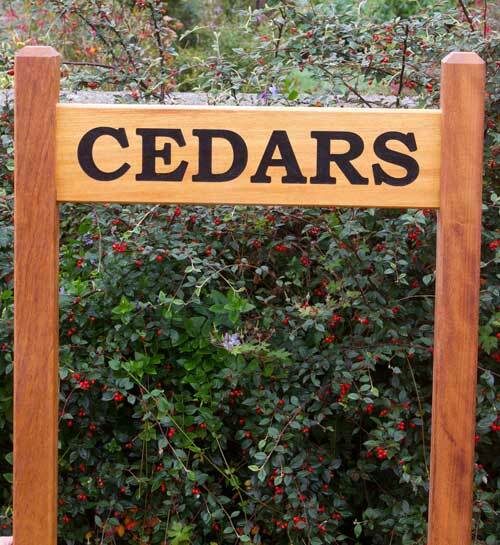 A shaped red cedar sign which measures 1200mm x 950mm. It was suppled with two 4"x4" oak posts. The insert is made using tough Anodised Aluminium. We can paint the lettering white. If using white paint we then treat the sign with Osmo Oil as varnishing would cause a slight yellowing of the letters. 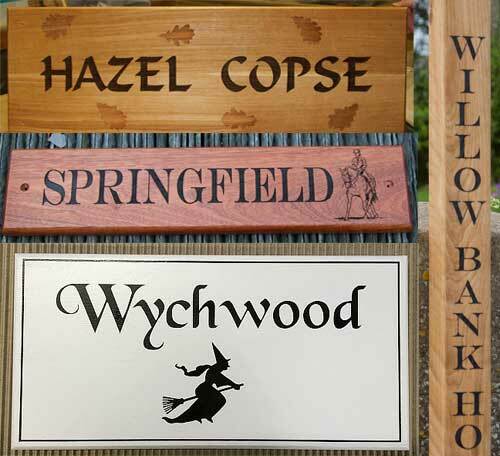 Now very popular are painted oak signs with painted letters. The oak grain can still be seen though the paint. 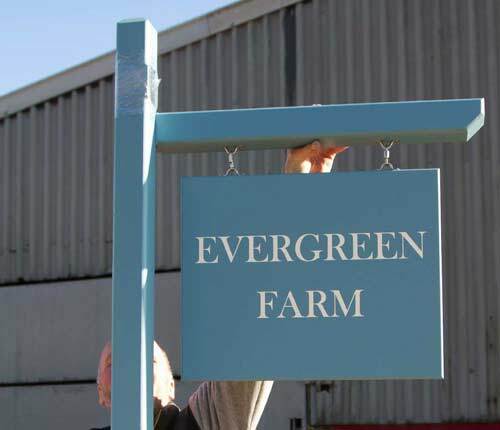 This sign is painted Farrow & Ball Carriage Green with cream text. This customer specifically asked for the darkest iroko wood we could find on our timber racks. Three boards were joined and the shield shaped. 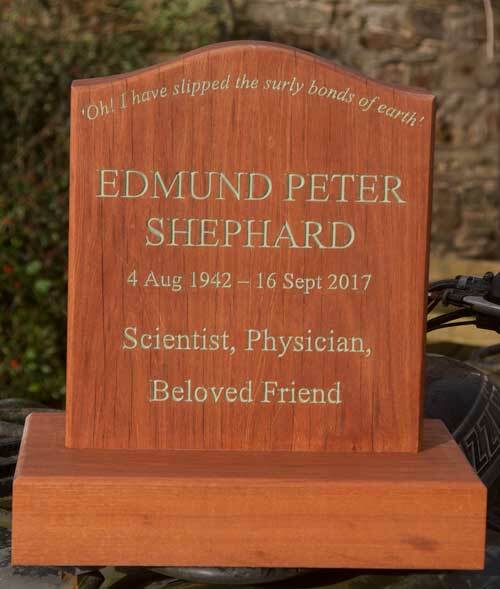 This bespoke oak memorial was made to match and existing memorial. 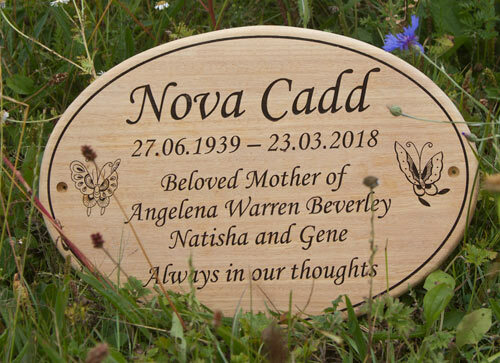 The carpenters in our workshops can make your memorial or wooden sign just the way you want. Larger wooden signs will always be made with thicker timber to stop the timber bowing. 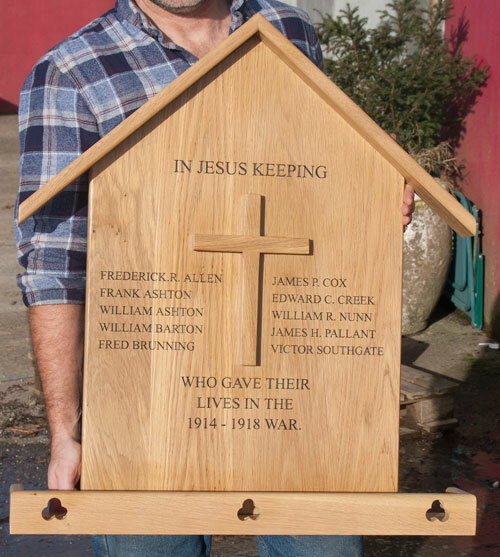 This one was made with 30mm oak. The curved text adds interest to the sign. 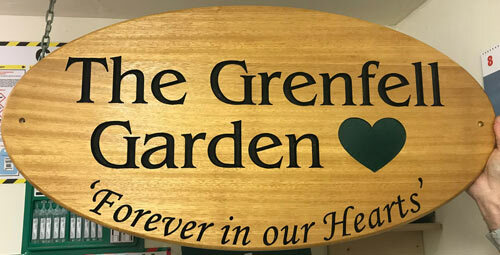 This sign was made for the memorial garden dedicated to healing, justice and peace for the community which was devastated by the Grenfell Tower fire. Unusual choice of timber for this sign! However we make the sign just the way our customer wants it. This sign has a line border with square corners. 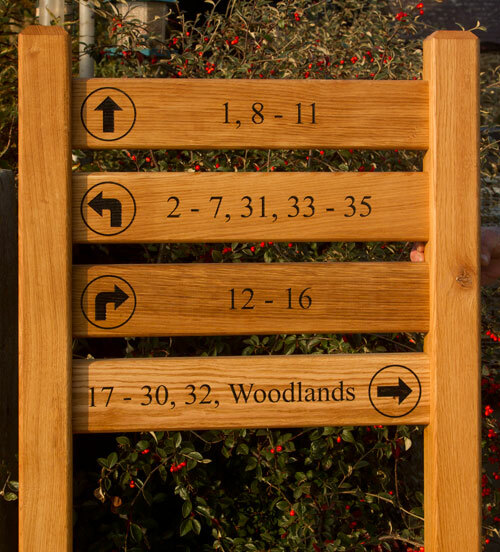 This sign was made of oak and measures 450mm x 150mm. Text and images were burnt into the timberr and then painted black. The size of this painted oak sign is 530mm x 225mm. With painted oak the grain is visable beneath the paint. This sign was double sided and sold with a ball end bracket. It was dispatched to France. 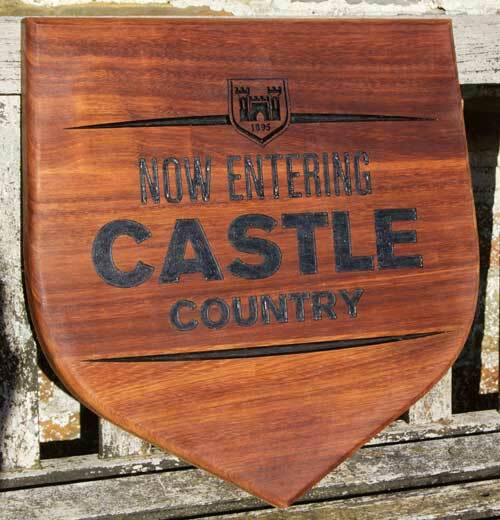 We do sell quite a lot of Man Cave signs! They do make very good presents. Cherry is not as durable as oak but can be used outside as long as well maintained. The rounded corners look good on this sign. 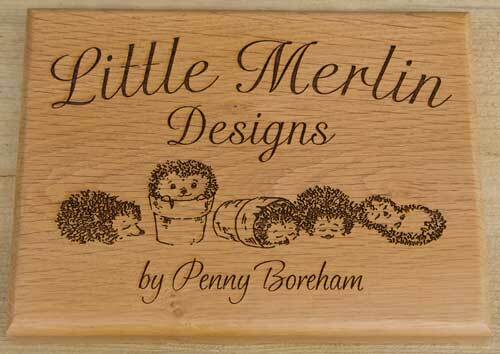 This wooden sign has been made in oak and the size is 575mm x 150mm. 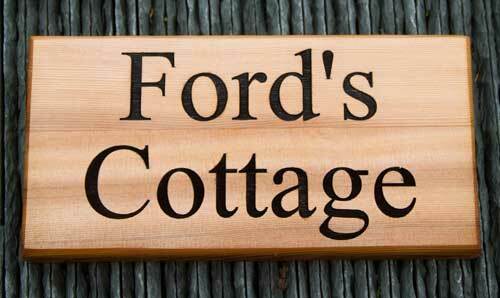 When there are lots of letters it is cheaper to use the elegant range of wooden signs. This wooden plaque was made in Iroko and the size is 600mm x 300mm. The stands are made as standard with 600mm legs but we can make to any size. Chestnut looks similar to oak but is a little cheaper. 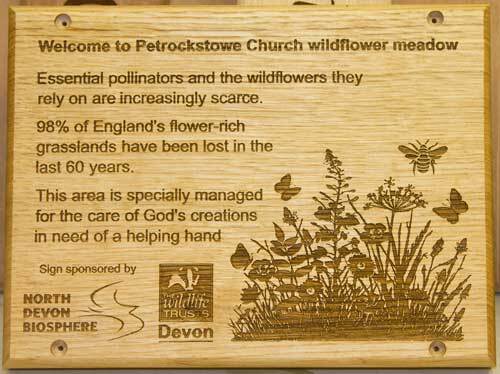 It is also a very durable timber making it ideal for wooden signs. The images, along with hundreds more, can all be found in our Image Library. Our carpenters do make a lot of different signs. This can be confusing to our customers. 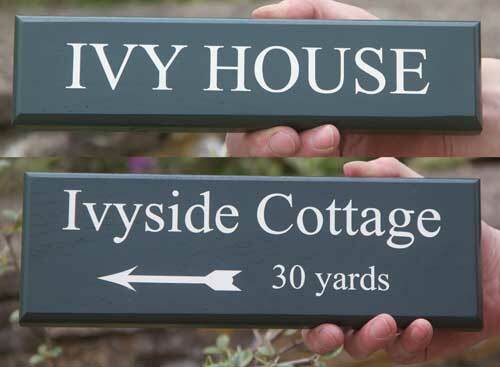 Either of the links below will show you the whole range of wooden signs. Don't forget you can call us for help. 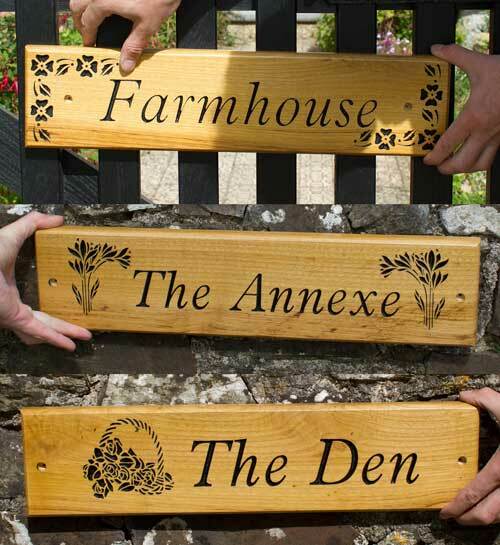 It is our aim to make your wooden sign just the way you want it. To see more fonts and images click on the links below.